Explanation: The great evening grouping of planets is coming to an end. Before all the planets went their own separate directions, however, the Moon was kind enough to pose with some of them. The planets in the above picture, taken last week, are Venus and Jupiter. Mars, Saturn, and even Mercury appear to the lower right of Venus but are too dim to be seen. Over the next two weeks, the Moon will rise later and later passing a full phase on May 26. Venus and Jupiter will continue to shine, moving together until their closest approach on June 3. 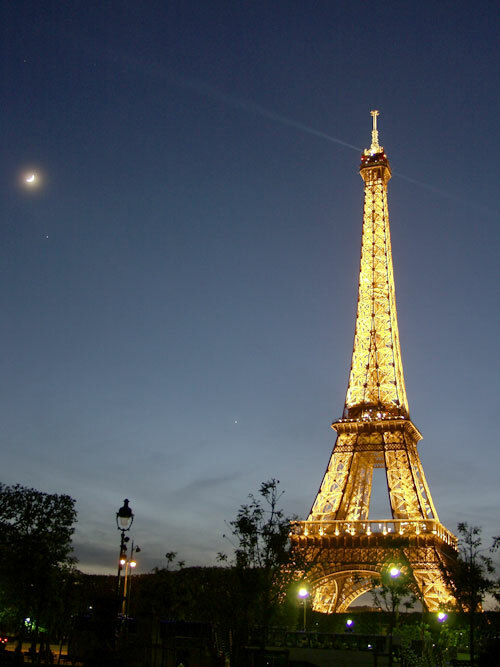 The Eiffel Tower, however, is expected to remain right where it is.